This crossword was maybe very strategically placed by the editors. Several of us perhaps worked well into the week attempting to solve last week’s difficult numerical crossword by Radix and we downloaded this week’s offering with real trepidation. Were we due to set aside a few days to decipher more Knights’ moves, courtesy of Sabre? Would this be the drop that caused the overflow and led us to stash away our BRB, Bradford, TEA, Thin Air Basic programmes, instructions for constructing tori, origami wrens and Towers of Babel for ever and return to cookery and gardening? (Oh yes, I shamelessly use all of those and more!) But no, it was not to be. Even the title proclaimed that Ferret had provided a short entertainment for us. Just what we needed! It was indeed ‘short’ and ‘entertainment’ from start to finish. I was becoming disconcerted to find that Ferret was opting out of the Listener compilers’ tipsy tippling gang but he redeemed himself with almost the last clue we solved. ‘Claims drinks (7)’ Of course, we had to sort out the theme and understand that we needed ‘only one of the letters of the omitted member, to be entered, above the entry’s column, to complete the entertainment’s context’. By that time, we had realized that BEYOND THE FRINGE had to go round the outside of our grid (a bit like Nutmeg’s PIGLET in this month’s Magpie solutions ‘The more he looked inside, the more piglet wasn’t there’ – there’s my Magpie plug – six Listener-style puzzles every month and Ferret is in there too, with a D this month!). We already had BEYOND TH? FRINGE and at last understood that CLAIMS = ALLEGES and that if we extracted the LEG, or at least its central E, we were left with ALES. We had perhaps been lucky, in that all the long clues solved themselves like magic, SC[H]OLASTICALLY, EYE[W]ITNESSES, IRRATIO[N]ALIST, ASTROD[Y]NAMICS, BR[E]ATHL[E]SSN[E]SS, INSTALLATI[O]NS and ANTIT[E]RRORIST and apart from a very brief Numpty red-herring where we suspected that we were looking for a ‘NOVELTY SHOW’ like Crufts, this all fell into place with ease and amusement. ONE LEG TOO FEW said TEA when we fed in O? ?LE?TO?F?W and we had to have a brief diversion to watch the Peter Cook and Dudley Moore sketch, then we laughingly completed our grid in time to cook supper. COOK? 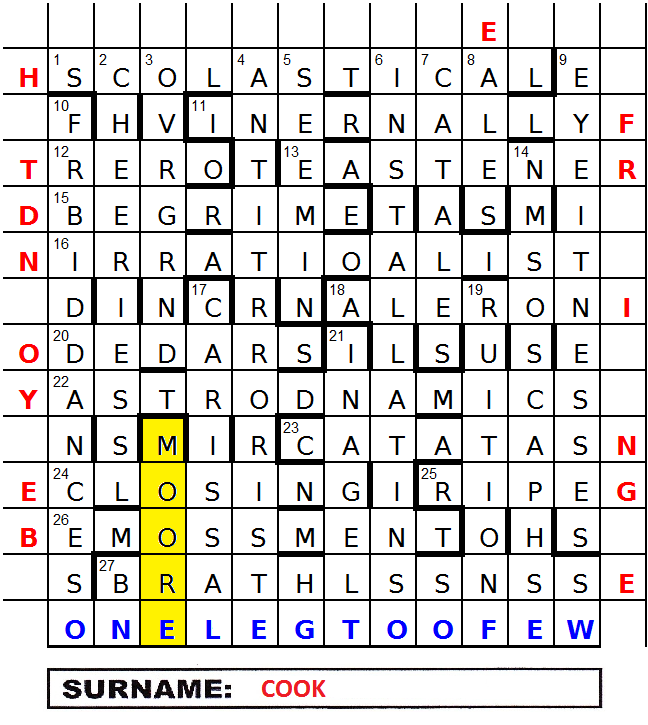 Yes, of course, we had found MOORE, so cleverly there at the foot of the third column with the missing E confirmed by all those Es that had gone from Shakespeare’s OVERGREENED (There’s this week’s conversation stopper!) Great fun, thanks Ferret. Here we had Ferret’s second Listener, and, with help from his Inquisitor puzzles, he has already become a firm favourite with me. His first Listener (#4207 Loco) required us to draw the National/British Rail logo in the grid. This week, we had a rather spiky looking grid with a box underneath captioned ‘Surname’. 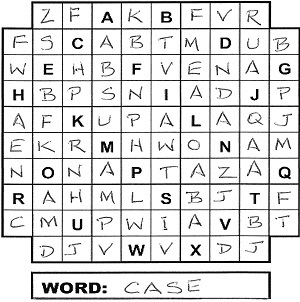 The clues were Letters Latent, with the appropriate letter (not given by the wordplay) moved to the perimeter, and that would help to reveal the theme. One clue would turn out to be Member Latent. Surprisingly, the number in brackets was for the answer not the entry, a bit of help that I don’t think is normally given with LL clues. 1ac was an immediate help, the wordplay being an anagram of ‘classic alto’ and SC[H]OLASTICAL popped up fairly quickly. Of course, not many of the clues were that easy. However, having moved on to the down clues — I often do that if I get a long answer across the top of the grid — ANTI-T[E]RRORIST and INSTALLATI[O]NS gave me further strong footholds in the grid. Unfortunately, Dyspnoea annoying child — hospitals initially flush sinuses regularly (14) for BR[E]ATHL[E]SSN[E]SS across the bottom of the grid (BRAT + H[ospitals] + fLuSh SiNuSeS) wasn’t such an easy solve. I got the Member Latent clue reasonably early on, AL[LEG]ES at 8dn, but that didn’t help me with the theme. I suppose if I’d sat back and cogitated for half an hour, my mind might have said “What was that video you were watching on YouTube last Thursday? That had a leg in it, didn’t it. In fact it was indeed a missing leg, like here, and was the fabulous Peter Cook and Dudley Moore sketch, One leg too few with the unidexter auditioning for the role of Tarzan.” My brain might then have continued “Now I know it would be too much of a coincidence for a Listener crossword to have such a theme only a couple days after you watched the clip, but everything fits.” Indeed, the first thought did happen, courtesy of a video link on Twitter. 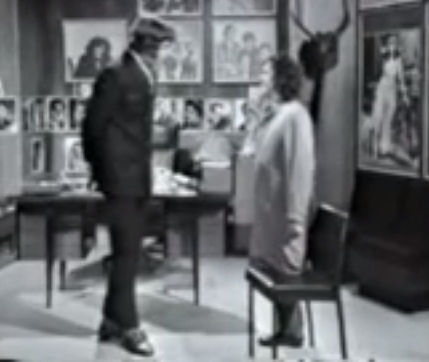 I don’t know the exact reason for the tweet — perhaps it was the 40th anniversary of Beyond the Fringe, which I believe is where the sketch was first performed. But, as I said, my brain wasn’t given time to come up with that, and probably wouldn’t have thought of it if I had given it the time. It needed me to get most of the letters of ONE LEG TOO FEW from the bottom row of the perimeter before the light dawned. From there, seeing that BEYOND THE FRINGE appeared up the left, across the top and down the right of the perimeter was straightforward. 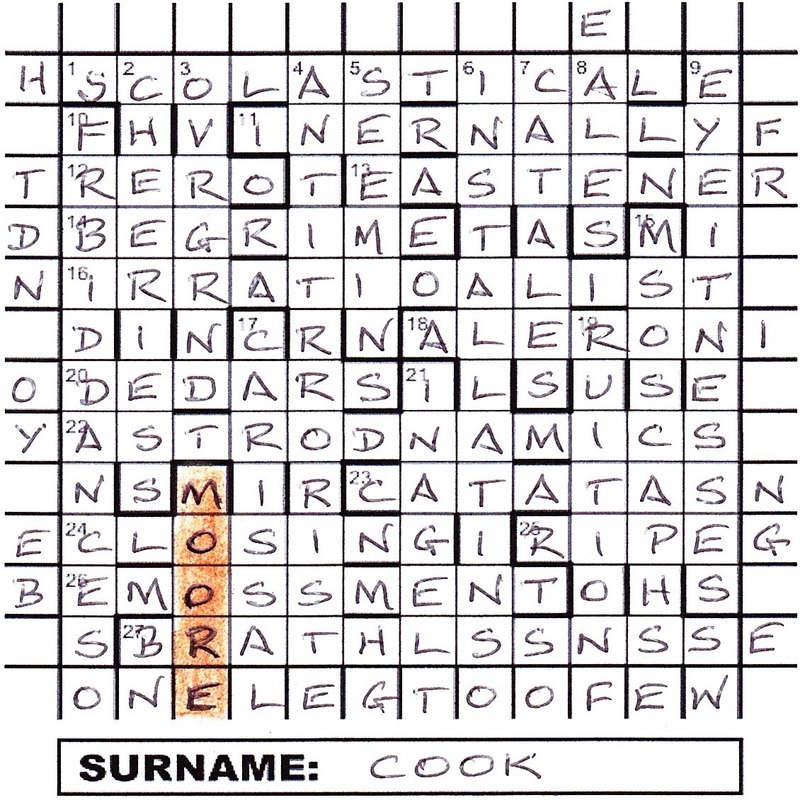 Dudley MOORE completed the unclued entry in the bottom left corner, which left the brilliant Peter COOK to be written in the space under the grid. And of course the three ‘members’ mentioned in the preamble were the three legs of the two performers. 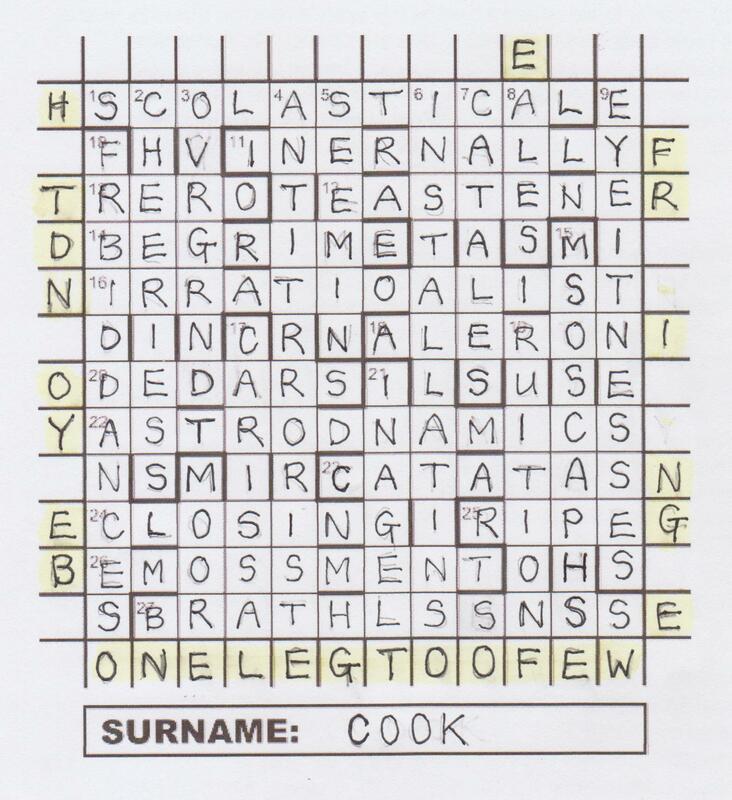 I believe Peter Cook wrote the sketch when he was 18 and considered it one of his best pieces of work. I probably wouldn’t disagree, so thanks for the puzzle, Ferret. I submitted Boxes to John Grimshaw on 18 May 2006. 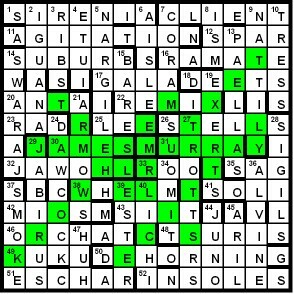 At the 2007 Listener dinner, Derek Arthur drew me to one side as I toyed with my pre-prandial drink and said that he liked the puzzle but unfortunately the solution was not unique — which rather spoiled my evening! A few days later, he rang up and apologized — he had inexplicably overlooked the fact that the three dimensions of each box were to have no factor other than 1 common to them all (he may have made the same mistake as quite a few of the 2013 solvers, having a = 10, b = 315, c = 270 in clue U, which is illegitimate, of course, as these three numbers share a common factor of 5) — and assured me over the phone that the puzzle had now been accepted. In spite of this good news, I heard no more until I emailed Roger Phillips on 18 May 2012, who kindly agreed to re-open the editorial process. In the puzzle as originally submitted, the preamble pointed out that an integer cannot be written as the sum of two squares if its prime factorization contains a prime of the form 4m – 1 raised to an odd power. This piece of information was intended to assist solvers, but Roger decided that it was likely to do little other than put off the average not-so-mathematical solver. In its place, I added that solvers may like to notice that exactly one of each box’s three dimensions must be odd and also that the letters in the four central cells may be arranged to form WHAP (a different kind of box!). I thought I’d got into the swing of the mathematical appearing on the penultimate Saturday of the three-monthly cycle, but yet again it was a surprise to see that my numbery brain needed to be brought to the fore. At least, it looked like a mathematical puzzle, except it was by Radix, and he only does standard crosswords, doesn’t he? Well, it would appear not, and a quick look at the preamble indicated that this would be a mathematical that would be as difficult in its own way as Radix’s normal œuvres. For a start, we weren’t dealing with pure factorisations, but the sum of numbers, albeit in this case squares. Moreover, of the 72 entry cells, 26 were unchecked. I guessed that the starting point would be the boxes with a side of single-digit length, albeit in base 24. That was the end of my guessing, although in hindsight I could have made a few deductions about the contents of some squares, such as box A side a which must begin AA or AB since the diagonal d was ABTE. I then googled for help on determining a formula for the sum of squares but, as I was to find out, a number could be the sum of none or many pairs of squares. I also wondered if the fact that all four lengths a, b, c and d had no common factor should be the way forward, but that didn’t help me. Finally, I turned to my trusty friend WolframAlpha. This helped me with the triangular numbers in Elap’s Three-Square back in November 2010…was that really three years ago? And so it was that it helped me here. Keying in a number told me everything I wanted to know about it, from the trivial (odd or even) through to whether it couldn’t be expressed as the sum of three squares and whether it could be expressed as the sum of two. I’m afraid that I cannot detail the exact route that I took to crack this puzzle…except that it was a near vertical climb. 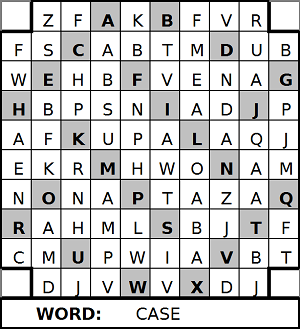 I think the first clue that I solved was for box M, followed by K, P, I, L and J. And, of course, I mean ‘the first clue that WolframAlpha solved’. I dreaded coming to a dead end and having to go back to the beginning, and progress was very slow over the course of two days…two long days! WolframAlpha was also a great help in converting a number in base 10 to its equivalent in base 24. For example “1024 in base 24” revealed “1:18:1624 (3 digits). As I neared the end, two things were on my mind. The first was the message being spelt out by the last letters of the c lengths. It looked as though they were trying to say Rotate eight, so infinity was uppermost in my mind although I couldn’t really see how that was relevant. I was also becoming very worried about “any apparent ambiguity” that we were warned about in the preamble. I eventually found it in the bottom right-hand corner with box T where side b could be BJ or QJ with the corresponding side c being QO or CO. There was still some work to be done on this, courtesy of the last letters of sides c, which had nothing to do with infinity, but spelt out Total height in base two four. No doubt adding up all the cs would give us the thematic word to be entered in the space beneath the grid. Two quick sums using the two options for box T, and I had CZWE and, more likely, CAME. Hmmm…even CAME didn’t seem quite right. OK, I’d arrived at the end, but that was hardly thematic. I checked Chambers for an obscure meaning of the word and was rewarded with “a lead rod for framing a pane in a leaded or stained-glass window”, which was certainly obscure but even less thematic. Perhaps Google would come to the rescue again. And it did: CAME – Computer Algebra in Mathematics Education, “an open, international organisation for those interested in the use of computer algebra software in mathematics education”. Perhaps Radix was telling me that he had expected me to write a computer program to help with the solution. I knew that was unlikely. So, just as I dreaded, it was back to square one (almost) as I checked the notes I had made from my solving process. Half a day later, and I was nearing the bottom left corner and I found where I had overlooked the two options for box U. As well as MC and KF for sides b and c, there was AC and QF. By this time I had prepared a spreadsheet with the four dimensions of each box in base 24 and base 10, so it just needed me to change a couple of figures, and out popped 42509, which WolframAlpha told me was 3:1:19:524 or CARE. Well, it was certainly something I had to take, but again it was hardly thematic. Of course, 90 minutes later I realised how much this puzzle was frying my brain as CASE was the correct translation. I’m not really sure what to write next. As a feat of construction it was a masterpiece, but to say that it was a struggle would be an understatement. Perhaps I should just say that, as I wrote this blog, I realised that, with all the bits of paper and grids floating around, I copied the wrong version to my submission sheet (and the grid above) and all that work was in vain!! !